Israel should expect a "strong reaction" if it announces new construction in Judea and Samaria, says EU official. The European Union (EU) is unhappy with reports that Israel plans to publish tenders for the sale of 1,400 housing units in Judea and Samaria, Channel 10 News reported on Thursday. A senior EU official who spoke to the channel issued a direct warning to Prime Minister Binyamin Netanyahu, saying that the EU would not tolerate new construction in Judea and Samaria. "There will be very little understanding on the part of European governments regarding any announcement of construction in the territories now under negotiations. 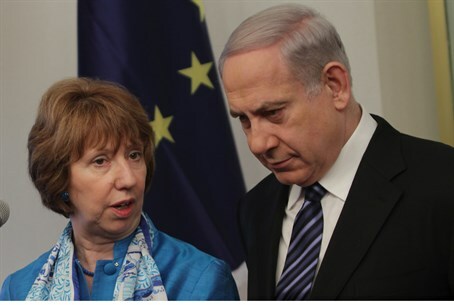 Israel should expect a strong reaction on the part of European governments if it is going to go in that direction,” said the official. Next week’s reported announcement will be timed to coincide with the release of 26 terrorist murderers, which is a “gesture” to the Palestinian Authority (PA). The announcement will come despite requests by both the United States and the EU that Israel refrain from announcing new construction at the present time. Previous announcements on construction raised the ire of the PA, which demanded that Israel cancel any tenders it has issued for new construction or the talks would be over. U.S. Secretary of State John Kerry has in the past said that Israeli announcements of new construction were expected and said that they should not affect the resumption of peace talks. The European Union recently pledged "unprecedented" levels of support to both Israel and the PA in the event that the two parties reach a final status agreement which would include the establishment of a Palestinian state in Judea and Samaria.